2018 Able Flight Pilots Get Their Wings! Front row (L-R) Asher Kirschbaum, Julia Velasquez, Rob Shardy Kory Puderbaugh, Staff Sgt. Robert Bartlett. Back row (L-R) Andrew Geers, Josh Fisher, Andrea Hayek, Austin Decker, Christina Gorsky. 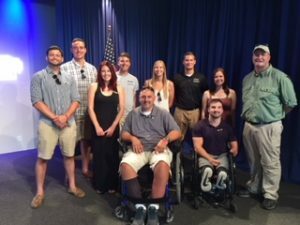 As they came on stage at EAA AirVenture to receive their pilot’s wings, the Able Flight Class of 2018 clearly represented our mission of enabling people with a variety of physical disabilities to become licensed pilots. From a young man who was born without hands or feet, to two pilots who are deaf, to a man paralyzed in an accident, and to a wounded veteran, this year’s new aviators may not be typical of the pilot population as a whole, but they are typical of the more than 65 people who have earned a pilot certificate through Able Flight. On July 24th at a special ceremony at AirVenture’s Theater In The Woods, Kory Purderbaugh, Julia Velasquez, Asher Kirschbaum, Rob Shardy and Staff Sgt. Robert Bartlett were honored for their hard work and success in becoming licensed pilots. Puderbaugh, Kirschbaum and Velasquez trained at Purdue University, and Shardy and Bartlett trained at The Ohio State University. On hand for the ceremony were family, friends and Able Flight sponsors, and pinning pilot wings were Jason Miller of Foreflight, John Herman of Tempest Plus, Michael Brown and Jonathan Stoy of Shell Aviation, Daniel Bachmann of Embraer, and Aviation Hall of Fame member Patty Wagstaff who did the honors for Lockheed Martin. Special guests included a number of the flight instructors who taught this year’s student pilots, including Josh Fisher of OSU, and Christina Gorsky, Austin Decker, Andrea Hayek and Andrew Geers of Purdue. During the ceremony, Geers was named the Able Flight 2018 Flight Instructor of the Year, and selected as co-recipients of the Seidel Award honoring their volunteer service were Brian Stirm and Lucero Duran of Purdue University. Able Flight thanks EAA for making the venue available for the ceremony.